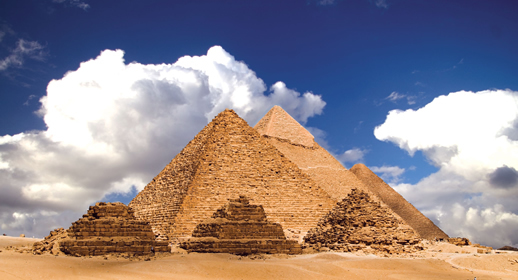 The ancient Egyptians, like other ancient peoples, were acutely aware of their environment and of the changing seasons. From very early in their history they seem to have been conscious of the seasonal movement of the heavens and to have used those movements as a measure of time and so to predict natural events. Such observations of the night sky helped them to devise their lunar calendar of 360 days, plus a further 5 additional (‘epagomenal’) days in honour of five deities. The lack of an additional quarter day eventually lead to significant errors with the result that the calendar would only align with the actual astronomical date once every 1460 years. The new year began on what is July 19th in the Julian Calendar with the heliacal rising of the dog star Sirius or Sothis (known to the Egyptians as Sopdet) which coincided with the start of the Nile inundation. The sky itself was seen as the goddess Nut. The body of the goddess Nut over-arched the earth and she was regarded as swallowing the sun in the evening before giving birth to it anew each morning. This aspect of the Nut as giving birth to new life and stretching herself over the earth, and the living things on it ,led to her being associated with the lid of coffins. Frequently she is depicted on the inside of the lid stretching over the deceased in, as John Romer has said, “an act of eternal union” and also the haven of the sun, bringer of new life, and the home of the circumpolar stars. 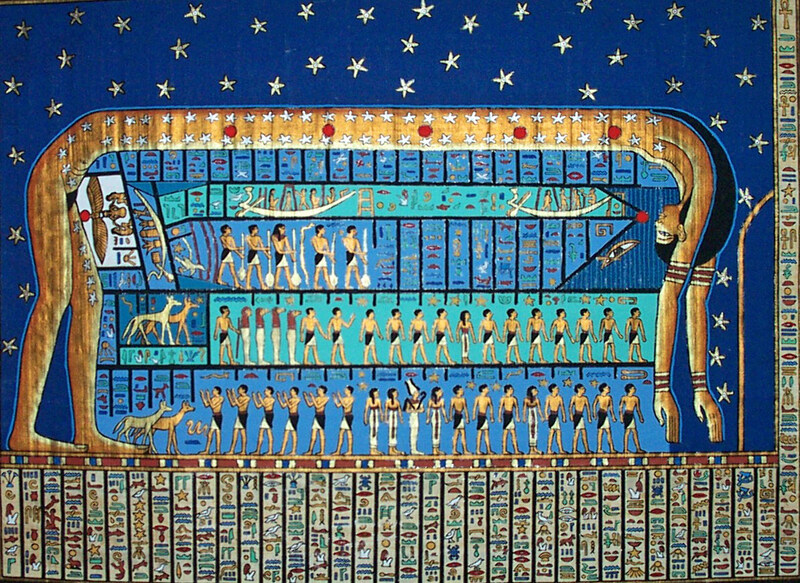 Nut was not, however, not the only aspect of the heavens to be represented on coffin lids. From the Middle Kingdom (2055-1650 B.C.) so-called ‘star clocks’ occur on some coffin lids. These comprise 36 columns listing a similar number of star groups known as ‘decans’. Each of these groups rose, in turn, above the horizon at dawn and remained in the sky for 10 days before being replaced by the next. Sirius was the brightest amongst these and rose anew every 70 days. This period came to be the same as that set aside for the mummification process and probably derived from the belief introduced in the reign of Unas (2375-2345 B.C.) that the deceased would appear again as a circumpolar star. This concept of heavenly rebirth with a visible presence in the sky must have provided some comfort to the bereaved. From the 18th Dynasty (1550-1295 B.C.) of the New Kingdom (1550-1069 B.C.) so-called ‘astronomical ceilings’ become a feature of some private and royal tombs and are accompanied by texts describing the sojourn of the Decan stars in the underworld. 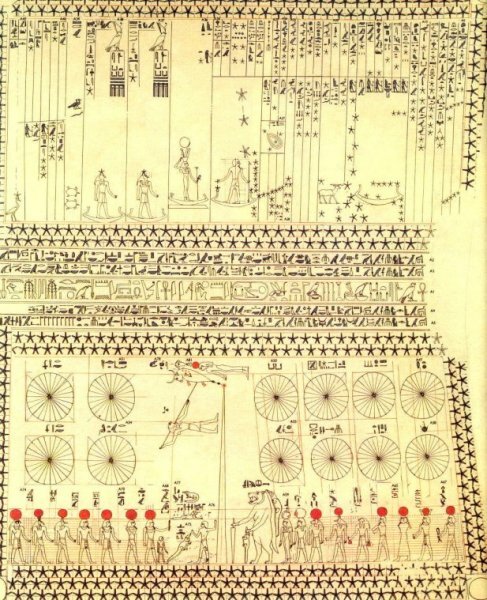 However, the idea that the movement of the stars could be used to predict human destiny so providing a horoscope seems to be introduced to Egypt in Ptolemaic times (332-30 B.C.) 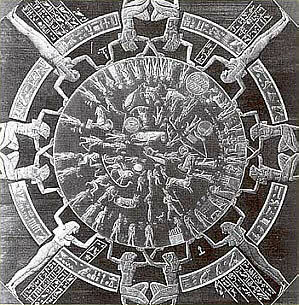 and by the 1st Century A.D.the Babylonian zodiac had been introduced and is incorporated into the ceiling of the Osiris chapel of the Hathor Temple at Dendera. Many aspects of Egyptian religious belief are seemingly contradictory and such is the case in funerary belief. There is an underworld, but also a journey to the stars and the dead person would each night be one of the crew of the sun god Re’s solar barque which would undertake a perilous journey through the darkness until it re-emerged triumphant at dawn to bring new light, new life and warmth the world. 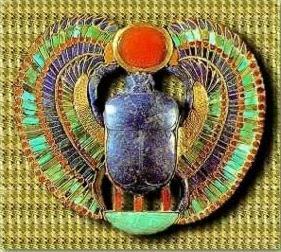 This symbolism of the sun as a bringer of life was also emphasised by the idea that the sun was rolled across the sky by the god Khepri, himself a scarab beetle. The analogy was with the scarab, or dung beetle, rolling its dung ball across the ground before burying it. From the dung ball would emerge the larvae of the beetle thus the ball provided new life. In the same way the sun would disappear beneath the earth (the horizon) only to re-emerge bringing life to the earth. Under the Pharaoh Akhenaten (1352-1336 B.C.) an attempt was made to move away from the idea of multiple deities (polytheism) toward a religion centred around a single deity (monotheism) and it was the sun which Akhenaten believed to be this single all-powerful deity in its form of the Aten. Akhenaten’s art shows the sun disc extending its benefiicient rays toward the king and his queen Nefertiti and quite literally bringing them life in the form of the ankh, the hieroglyphic sign for life. 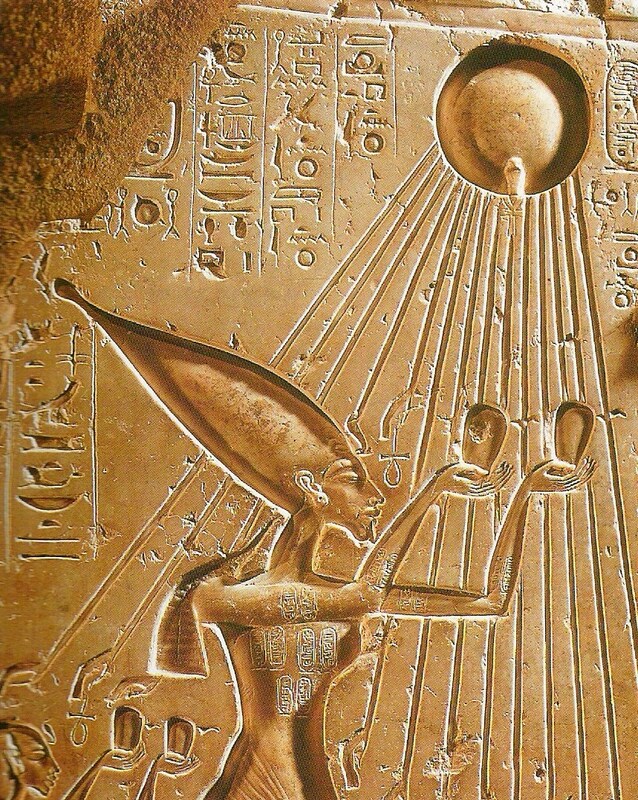 Whilst this religious reform was short lived, lasting little beyond Akhenaten’s reign, it is not insignificant that it was the sun which was identified as the universal bringer of life and a suitable candidate for sole worship. Whilst the period of Atenism, known as the ‘Amarna Period’ after Akhenaten’s new capital city at Tell el-Amarna, focussed solely on the sun, at most times the sun god, in his form of Re was an important deity worshipped alongside others and sometimes combined with others as in his form Amun-Re, ‘King of the Gods’. As noted, the worship of multiple deities was the norm in ancient Egypt and fitted well with their concept of living ordered, truthful and balanced lives – the concept of ma’at. 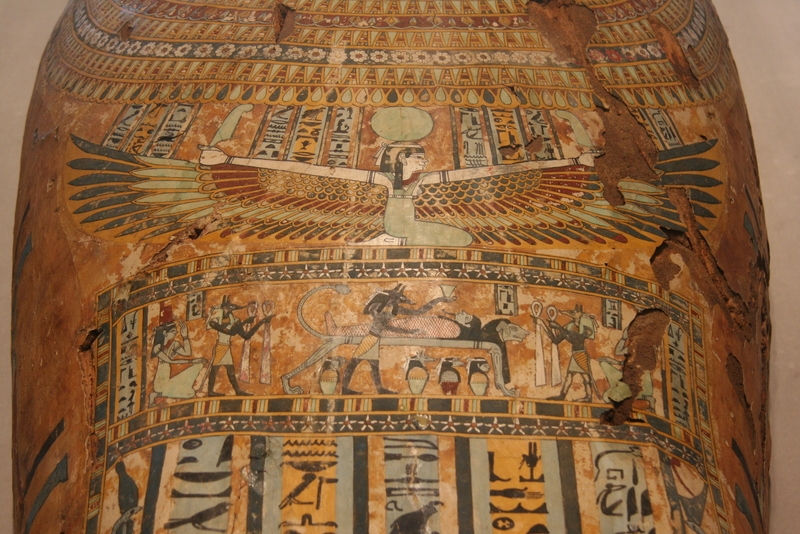 This balance could extend to balancing deities within sacred landscapes, thus at Saqqara (near modern Cairo) we find a catacomb of Falcons which were sacred to Horus, but also associated with Re-Horakhty, a form of the sun. This solar symbolism is balanced in the landscape by the provision of a catacomb for ibis. 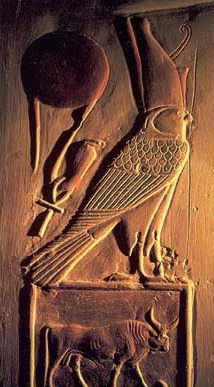 Ibis were sacred to the god Thoth, a deity of wisdom but also a lunar deity. Thus the lunar ibis (with its black and white plumage for night and day and curved bill representing the moon) was balanced by the solar falcon.